THE LEADERS OF Britain’s three main political parties have signed a joint promise to give Scotland “extensive new powers” if its voters reject independence in the referendum on Thursday. Prime Minister and Conservative leader David Cameron, Deputy Prime Minister and Liberal Democrat leader Nick Clegg, and Labour leader Ed Miliband, issued the pledge this morning in the Scottish Daily Record newspaper. In it, the three men promise to guarantee the permanence of the Scottish parliament, and to continue the “Barnett formula” of state funding – allowing Scotland to freely choose its national health budget. The people of Scotland want to know that all three main parties will deliver change for Scotland.WE ARE AGREED THAT:The Scottish Parliament is permanent and extensive new powers for the Parliament will be delivered by the process and to the timetable agreed and announced by our three parties, starting on 19th September. And it is our hope that the people of Scotland will be engaged directly as each party works to improve the way we are governed in the UK in the years ahead. We agree that the UK exists to ensure opportunity and security for all by sharing our resources equitably across all four nations to secure the defence, prosperity and welfare of every citizen. And because of the continuation of the Barnett allocation for resources, and the powers of the Scottish Parliament to raise revenue, we can state categorically that the final say on how much is spent on the NHS will be a matter for the Scottish Parliament. We believe that the arguments that so powerfully make the case for staying together in the UK should underpin our future as a country. We will honour those principles and values not only before the referendum but after. People want to see change. A No vote will deliver faster, safer and better change than separation. 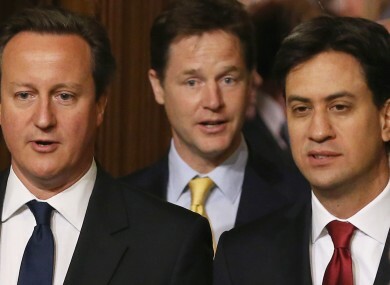 Email “READ: UK party leaders pledge more powers if Scotland votes No”. Feedback on “READ: UK party leaders pledge more powers if Scotland votes No”.